I'm getting my crafting head back on! I have a couple of projects on the go at the moment. One is a birth record for my brother-in-law and his missus who are expecting their first baby at the end of October. Another is a large card for my step-brother and his missus who are also expecting their first baby at the end of October. A mini baby boom! Last night I salvaged the Christmas cards I made last year and forgot to take over to the family. I had them signed from me, Mark, Jack and Squiggle... but now of course Squiggle is here and called Tom. So I had to line all the cards with some pretty paper and re-write them back to the same people. I just need to remember to actually PACK them this year!!! 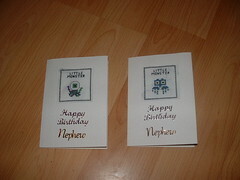 This is a pair of birthday cards I quickly stitched for our nephews, when the night before we were due to visit them Mark said "Oh, I haven't bought any cards for Chris and Nicky!" Luckily I had just bought some aperture cards and some new magazines which just happened to have mini monster patterns for buttons. It took me until almost midnight to do them both in a single sitting, but worth it I think. My mum has also - as an early birthday present - bought me a small sewing machine. She offered to spend £100 on one for me! But as I am notorious for being RUBBISH with sewing machines (I broke the ones we had at school) I thought a £25 portable from JML would be a better option. I might graduate up to a bigger, better, more expensive one at some point in the future, but lets see how this goes first. I think it must be the maternal hormones running riot in my body combined with a creativeness that has been itching to get back out for years.